Okay, you guys, this is getting a little out of control. American Idol has been going on for a [long] while, and I understand they need to shake it up a little bit. That's fine. We did that with Kara, we did that with Ellen (yeah--remember that? ), we did that with Steven Tyler, we did that with J.Lo. No more shaking it up. The worst part of this is that all other talent competitions are just throwing their hands in the air and saying, hm, why not, American Idol did it, and drawing rando names out of a hat to decide who their next judges will be. Everyone can't be a judge on a televised talent show, okay? Otherwise no one would be actually doing their jobs. I mean really. What is this? Is there no loyalty anymore? I want to know why none of these celebrities are staying for more than a year. [Except good ol' Randy, holdin' it down for yet another year, which I assume is only because he couldn't stand the idea of us having to stare at Enrique Iglesias' beauty mole and listen to his opinions on pitchy 18-year-olds for four months. He really does have our backs, you guys.] Just when we get used to judges and can say things like, "oh that Steven, he never says anything intelligible," they yank him out and throw in Nicki Minaj. Not okay. And why is this all of a sudden a coveted career move? Let's talk about X Factor, for example. There was speculation for months on who the new judges would be, and one of them ended up being Britney Spears. BRITNEY freaking SPEARS. She is arguably one of the most prominent pop culture icons of all time, and she's sitting behind a desk beside a rose-haired disney channel star watching people twirl flaming batons and whatnot. Come on. I get that she shaved her head that one time and married a guy named Federline, and she does currently make music that is iffy at best, but I still think she's better than this. I guess, to these people, any publicity is good publicity. ((But if that were the case, Lindsay Lohan would be Queen of Earth by now.)) America sees your face week after week and then I suppose buys your terrible album or something. But isn't there a better way to make money? Like, performing music or something? Even The Voice, which I think has had the least-awful judges out of the talent competitions currently on T.V., ((This therefore excludes The Sing-Off, which includes Ben Folds and Sarah Bareilles, who are both awesome. May it rest in peace.)) decided to play musical chairs this Spring and bring in Usher (in place of CeeLo) and Shakira (in place of Christina Aguilera) temporarily. Am I the only one noticing a very distinct pattern in the producers' choice of replacements? Just sayin'. SIDEBAR: You will NEVER guess what CeeLo is doing while on hiatus. Never, ever, ever. Are you ready? He is working on a scripted comedy series for NBC based on his life. That is just great information. I hope that becomes a thing. To summarize: musicians, you don't have to do this. Have some self-respect. 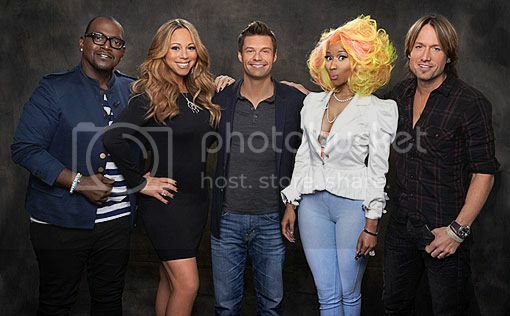 Keith Urban, you don't have to stand next to Nicki Minaj and try to look interested. You have a career. Really, you do. I know the industry is going a different direction, but that doesn't mean you have to listen to pretentious people try to prove their talent to you while Mariah Carey and Randy reminisce about the good ol' days. You're married to Nicole Kidman, for goodness' sake, and you have an Australian accent. You're basically winning at life. Why would you do this to yourself? Who do you think are the best and worst choices for talent show judges on TV (current or past)?